A greenhouse is designed to control most of the environment surrounding the plants. Computer-controlled variables include the temperature, moisture level and nutrient elements. Optimization of these variables enhances productivity, flavor and quality. Most growers use hydroponics -- the growing of plants in inert media (e.g. rockwool, sand, gravel, etc.). This eliminates the traditional medium, soil. The most commonly used medium is Rockwool, an inert rock-based growing medium with excellent water-holding capacity. It helps produce better quality crops with greater efficiency and provides a cleaner working environment. Most of Ontario greenhouse growers use "beneficial insects" instead of pesticides for pest management. The concept is simple: good bugs eat bad bugs. Strips of yellow sticky paper are set out to catch and count the pests, and predators or parasites are released accordingly. It is a virtually pesticide-free way of keeping crops healthy. Cucumbers are very low in calories. A cup of sliced cucumber contains 14 calories and is a source of Vitamin C.
The first experiments with greenhouse horticulture were by the ancient Romans. It wasn't until the Victorian period, when it became possible to properly control ventilation, heating and irrigation, that the industry began to grow. Greenhouse vegetable growing in Ontario became popular shortly after World War I. Ripe Ontario greenhouse cucumbers should be long, thin and firm. They are individually sealed in plastic to protect their delicate dark green exterior and help retain their natural moisture. Their exterior color should be a deep vivid green and they should feel heavy for their size. 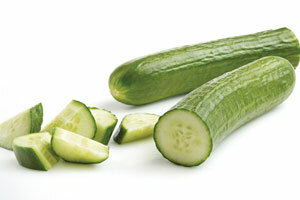 Greenhouse cucumbers can be stored in their original plastic at cool room temperature, or in the refrigerator crisper. Greenhouse cucumbers need not be peeled, and there are no seeds to remove. The skin contains most of the nutrients. Cucumbers are almost always eaten raw, by themselves, in salads or as a sandwich vegetable. 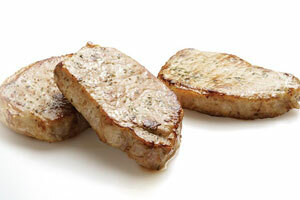 They can be gently steeped in butter, stock or even cream, or cut in half, lengthwise, poached and filled with a savory mixture of rice and herbs. Greenhouse cucumbers can be salted if desired.